The University of Wisconsin-Madison School of Medicine and Public Health (SMPH) has established a new Office of Global Health, in coordination with the University of Wisconsin Global Health Institute (GHI), with a goal of better serving faculty, staff, students and health care providers in the health sciences programs. 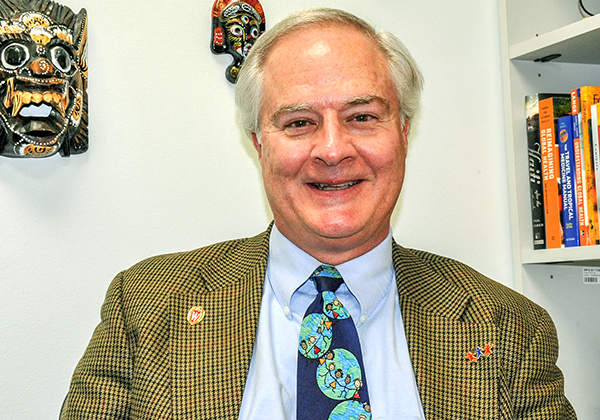 Jim Conway, M.D., an associate director at GHI, is director of the new SMPH Office of Global Health. Chris Olsen, DVM, Ph.D., also a GHI associate director, continues to lead the Graduate • Professional • Capstone Certificate in Global Health Program. Programs Coordinator Betsy Teigland, BSN, will continue to manage the certificate program and other international educational opportunities for health science students. The new office will be located in room 1191F in the Health Sciences Learning Center. The SMPH office is dedicated to working closely with the health professional programs in the schools of Medicine and Public Health, Nursing, Pharmacy and Veterinary Medicine. It is the focal point for graduate and professional global health experiences, from the certificate program to interdisciplinary field courses, service-learning opportunities, international clerkships and the Medical Spanish course. Information about these opportunities can be found at education.ghi.wisc.edu. The office will continue to work closely with GHI to organize and promote global health education, research and outreach opportunities, including the annual Global Health Symposium. “I’m thrilled to see SMPH raising the priority of global health that much higher,” says GHI Director Jonathan Patz. “This commitment will ensure a vibrant engagement to serve students, staff and faculty across the health sciences through its SMPH Office of Global Health. The UW Global Health Institute encourages collaboration across disciplines and supports research, education and outreach to improve the health of humans, animals and the planet. The Institute is guided by a global health ethic that looks to improve health today while ensuring that resources are available to provide health for all tomorrow.